^ Nancy R. Tague. Seven Basic Quality Tools. The Quality Toolbox. Milwaukee, Wisconsin: American Society for Quality: 15. 2004 [2010-02-05]. ^ McNeese, William. Over-controlling a Process: The Funnel Experiment. BPI Consulting, LLC. July 2006 [2010-03-17]. ^ Wheeler, Donald J. Understanding Variation. Knoxville, Tennessee: SPC Press. 2000. ISBN 0-945320-53-1. ^ Western Electric - A Brief History 互联网档案馆的存檔，存档日期2008-05-11. ^ Shewart, W A. Economic Control of Quality of Manufactured Product. Van Nordstrom. 1931: 18. Deming, W E (1982) Out of the Crisis: Quality, Productivity and Competitive Position ISBN 0-521-30553-5. Deng, H; Runger, G; Tuv, Eugene (2012). "System monitoring with real-time contrasts" Journal of Quality Technology, 44(1), pp. 9-27. Mandel, B J (1969). 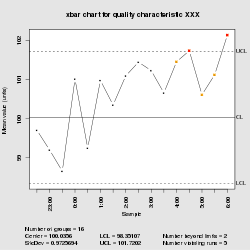 "The Regression Control Chart" Journal of Quality Technology. 1 (1), pp 1–9. Oakland, J (2002) Statistical Process Control ISBN 0-7506-5766-9. Shewhart, W A (1931) Economic Control of Quality of Manufactured Product ISBN 0-87389-076-0. Shewhart, W A (1939) Statistical Method from the Viewpoint of Quality Control ISBN 0-486-65232-7. Wheeler, D J (2000) Normality and the Process-Behaviour Chart ISBN 0-945320-56-6. Wheeler, D J & Chambers, D S (1992) Understanding Statistical Process Control ISBN 0-945320-13-2. Wheeler, Donald J. (1999). Understanding Variation: The Key to Managing Chaos - 2nd Edition. SPC Press, Inc. ISBN 0-945320-53-1.